Dimensions 8.25W x 10H x 4D in. 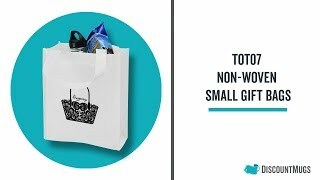 Our custom promotional printed gift bags are the latest in promotional items fads. Available in green, orange, pink, red and yellow, these cheap reusable bags will accommodate to your allotted budget and marketing motif. Our non-woven totes can be personalized with your logo, brand name and texts, thus expanding your market reach. Its small design is ideal for gift sets, tradeshow goodies bags and more. To upload your logo, simply download the template for your customized gift bags and place your logo within the imprint area of the design. Upload to our site at the time you complete your order. You may also select from the gallery of clipart and fonts, available free with your purchase of imprinted bags. Get started today and save with our everyday low prices guarantee on all bulk printed tote bags. ColorSplash is the latest feature in product customization which offers an array of multicolor printing designs with high-resolution results on any imprint area. ColorSplash can be used to generate artwork that exceeds traditional multi-color limitations and can reproduce original artwork with expert precision. Printed images from ColorSplash produce breathtaking results that are vibrant, colorful and well defined. Just want we ordered. Right size, color and design. we are pleased. My logo printed perfectly in the color I expected and I got my shipment 5 days after placing the order. My expectations were exceeded! These bags are well made. Our patients love them. They are perfect lunch bag size. Absolutely amazing! The product turned out awesome, and the delivery time was unbelievable. It arrived way before we thought it would. So Happy! Discount Mug is now my go to! Exactly what we were expecting - and they arrived faster than expected!